Have you started making your own yogurt yet? b) get up off your heiny and start making some yogurt or I’m going to come to your house and knock incessantly on your door until you let me in and pour me a cup of coffee so I can feel welcome while I watch you make yogurt! No seriously, you really should be making your own yogurt by now. I was talking to a friend of mine last weekend about her problems digesting dairy. We were chatting over homemade pizza and she joked about “paying for it” because of the cheese. So she tells me she took two Lactaid before dinner, then two during dinner because she struggles with digesting dairy. I asked if she ate yogurt, and when she said no, I suggested she start eating it to help increase the good, healthy bacteria in her gut. She then replied that she didn’t eat yogurt because she thought she was lactose intolerant (her digestive issues being the sign). Want to know what else yogurt can do and why you should start making it NOW? I thought my original heating pad method was the easiest method on the planet. Then I saw my friend Katie’s method for making thick and creamy yogurt and she had me beat by one step! I couldn’t be one-upped on simplicity, so I gave hers a try. Folks, this newer, easier, simpler method is the bomb. Not having to quickly clean out the pot so I can dump it over the jars is so teeny tiny, but it’s the little things in life that make a difference! Plus now I can make soup AND yogurt on the same day! I’ve never had a bad batch of yogurt with my old method, but now I’m even more certain than my new method will always be just as great. 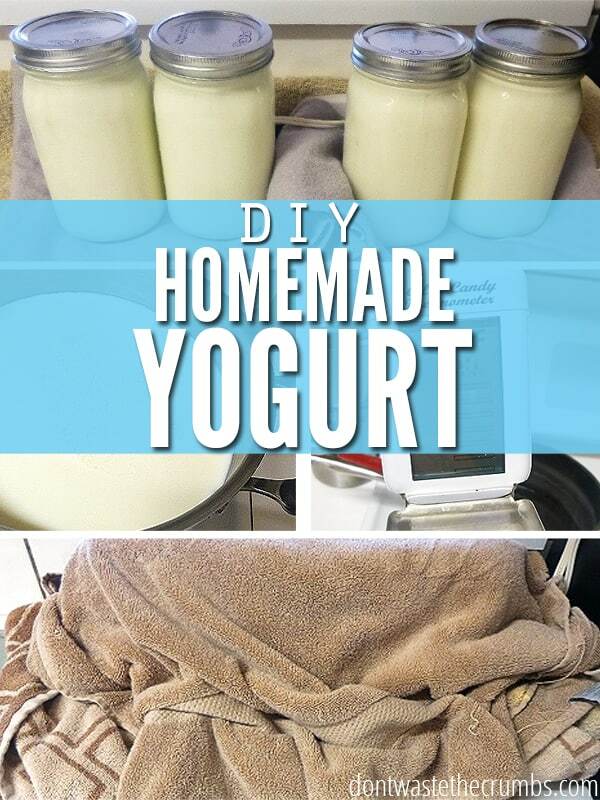 Delicious, homemade yogurt using a heating pad and 3 towels. 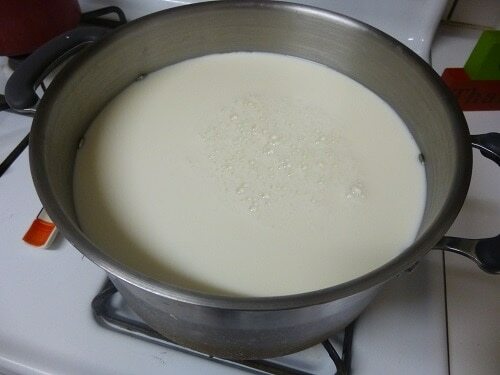 Pour one gallon of milk into a large pot. 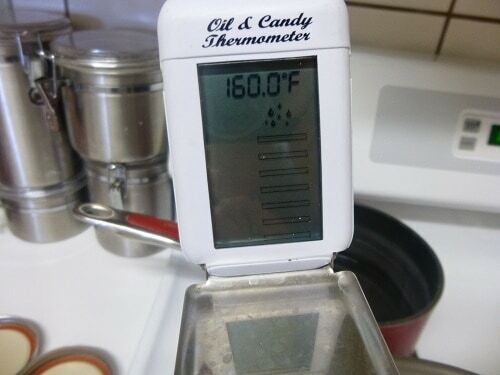 Heat milk on medium high heat until the milk reads 160 degrees on a thermometer. 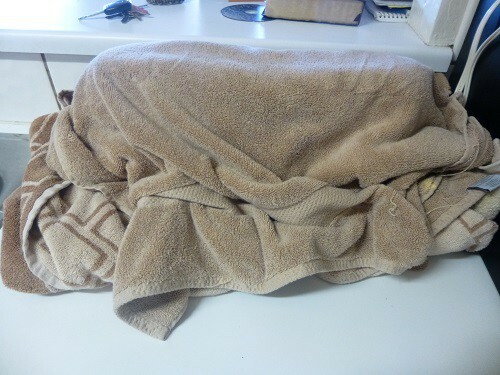 Meanwhile, line the counter with a folded towel and heating pad turned on low. Line four clean glass jars on the heating pad. Measure ¼ cup of whole yogurt into each glass jar. Remove the milk from the heat when it reaches 160 degrees and allow it to cool to no cooler than 115 degrees. Pour into glass jars and stir well to combine warm milk with warmed yogurt. Cover the jars with two towels, creating an incubation station. Allow yogurt to culture for a full 24 hours before moving the jars to the fridge to cool. Enjoy thick, creamy and delicious homemade yogurt! Unsure what type of milk to use? This chart will get you started. Does homemade yogurt freak you out? Don’t worry, I was there too. Sometimes it’s easier to start with a culture from a tried-and-true source. Homemade yogurt not thick enough for you? Use this tutorial for homemade Greek yogurt. Here are just a couple of the tools I use in this process. None of them are required, but they’re definitely helpful! Let’s be honest – have you made your own yogurt yet? Why or why not? how do you make it in the crock pot? i don’t have a heating pad. thanks! I do a half gallon at a time. Put half gallon in crock pot. Heat on low for 2 hours and 45mins. Turn off and let sit as is for 3 hours. Then put half a cup of yogurt and half a cup of the heated milk in a bowl and whisk until mixed. Then add to the rest of the milk in the crock pot. Whisk one more time. Put lid back on crock pot and wrap the whole thing with a thick towel or blanket and let it sit for 12 hours. After 12 hours its done!! awesome! i’m off of work tomorrow and i’m going to try this. if i’m successful, i can buy a gal of whole milk at costco for $3.30 instead of buying the 2-pack of greek yogurt for $6.89! haley, for clarification, you put the yogurt into jars after the entire process is complete (after sitting for 12 hours)? whereas tiffany adds her cooled milk to jars in step 5 of the process? thanks for the help, haley and tiffany! Yes you can – see Haley’s comment. So easy! I have been looking for an easy yogurt recipe. I have been looking for dairy free however since my daughter is intolerant. I am so curious about how this can help intolerance, can you point me in the right direction for more information? She is intolerant to all dairy proteins the doc is thinking, can it help with all or just lactose? Hi Candace! The good bacteria in yogurt (and other fermented foods) eats the lactose in yogurt as it cultures, and it leaves very little (practically none) lactose when you make it at home for a full 24 hours. The good bacteria in yogurt can then help build up her gut to properly handle other diary items too. Many lactose-intolerant folks can eat cultured dairy or raw dairy (since it contains lactase, the enzyme our bodies need to digest lactose). If she has issues with homemade yogurt, she might be in that few percentage that unfortunately can’t do dairy at all. Thanks Tiffany! We have milk protein issues as well so I’ll have to test it out one of these days! Thanks so much for the info! I upped the starter yogurt to see if it made a difference in thickness in the end. I don’t think it did, but I’ll try it with 2 Tbsp the next round to rule it out. If you want to mix the yogurt with milk first, mix approx 2 cups cooled milk to room temp yogurt, them mix that with the rest of the milk, then pour into the jars. Mixing the room temp yogurt right in with the milk might yield an uneven distribution. But then this adds a couple steps to the process too (which are eliminated with this new updated method). I’ve run into the same problem Shana – 4 qts = 1 gal, but I’m almost always left with about 1 cup of milk, lol. Using the new method (without mixing the yogurt w/milk outside of the jars), means leftover milk can go back in the fridge and not wasted. Shana, she is using quart jars too. There are 4 quarts in a gallon. 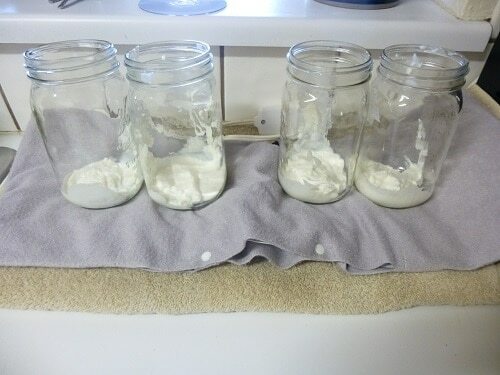 Divide the yogurt so you put 1/4C (4TBS) yogurt in each quart jar, then fill the jars up with milk. No, I have not made my own yogurt…but, I made a “cream cheese” From yogurt! Just recently…2 pieces of cheesecloth, a container of organic yogurt and a piece of string or yarn. Put yogurt in cheesecloth and hang over a bowl, or put the ball in a large strainer placed over a bowl (what I did). Let stand 8 hours or overnight depending on what consistency you want…greek yogurt or cream cheese. It’s interesting anyway..a little ‘yogurty’ tasting “cream cheese”. just thought of it…is that why they call it “cheesecloth”? lol guess it is? Blown away! Two questions…. Could I add fresh fruit to the canned mix and let stand for 24 hours? Also, what temperature do you maintain before refrigeration? Cheers! Eileen – make your yogurt first, then add fresh fruit when it’s done. The fruit will prevent the yogurt from culturing properly. I think my heating pad is in the 100-110F range. I’ve noticed that “medium” cooks my yogurt instead of culturing it. I noticed that the crock pot recipe by Haley (posted above)only allows the yogurt to culture for 12 hours instead of the 24 in your recipe. Because of the slightly different method of cooking is this enough time to culture properly? Hello! I tried it! Am I expecting it to be like commercial yogurt or did I do something wrong? It is very thin. I did try the “Greek-style” draining off of the whey, but really most of it is too thin. Hmmm… I’m sorry it didn’t turn out Julie 🙁 There could be any number of reasons why: not enough culture, weak culture, temp too cold, temp too hot, not culture long enough… Usually the culprit is a too cool incubation temp or too hot (and the cultures are killed immediately). Did it just make thin yogurt? Or not yogurt at all? What type of yogurt did you start with? I started out with plain, Greek yogurt. I had to leave, so I added the warm milk (at 119 degrees) and then incubated it all night. It was just shy of 24 hrs. When I scooped it out to make “Greek” yogurt, the bottom of the jar was “curddy”… so I thought possibly the heating pad was too hot, but I set it according to your instructions…maybe need another layer of towels on the bottom and top. I like this method….I have thought of trying “le crock pot” idea….but I like it in the jars. Thanks for any advice! Thx for replying! No Worries….it cultured and I think I may have added the milk as too hot. I will try the crock pot method. Now, it all homemade yogurt thin and that is why, commercially, they use stabilizers and thickeners ? I thought they did! As consumers we have been “trained” to “expect” perfect fruit & vegetables and other food. I appreciate your site Tiffany and looking forward to getting your e-book(Protein–no Powder) on my iPad to take with me when I travel soon! Trying the Crock pot way today. I appreciate you comment and Tiffany for getting me to try it again! Sending luck your way Julie! Thank you! But trying a new thing, when I am tired=burned up crock pot and cooked milk! Ha! going to try it again—a smaller amount in a smaller crock( i started with a gallon of milk!). The pot that melted has given us 16 yrs of meals—R.I.P. 🙂 I guess I JUST HAVE to get a new one with a timer—maybe even one that can brown and then “convert” to a slow cooker—i guess my enthusiasm betrays me! Hmm, that sounds likely. How cool should it get? All the way down to 115 degrees? The toddler lost patience and started screaming so I bet I didn’t let it cool long enough. I’ll check Katie’s troubleshooting guide, too. Thank you! I started my yogurt at 9 pm and forgot that my heating pad has an automatic shut off. Will this affect it? I wrapped it in 2 towels and left it on the counter. I turned back on the heating pad when I got up at 6 am. Hoping I didn’t ruin it. Help!? Honestly Lauren, it might be ok, but it might not. Some people can make yogurt with just the towels and no warming device… If it “fails,” it’s still great for smoothies and such. But there’s a chance it’ll still come out thick for eating straight! I just made yogurt in my crock pot. I turned out great! It was a little runny but I drained it in cheesecloth for about 1 1/2 hours and it was perfect. Longer and it probably would have been closer to Greek. So how did the crockpot method work? I am still on the fence about making my own but when I buy it from the store, my family scarfs it down in 2 days. They all (hubs and 4 of the kids) love it for breakfast with granola and fruit. So I need to learn how to make it or add it into our budget. Being as I just purchased your Awesome Meal Plan, and am enjoying that my grocery budget has been drastically cut, I’m not willing to go back. Here’s my dilemma: An organic gallon of milk is basically $6, yogurt around $3… so does it really pay off to make my own, when it makes 4 quarts? It’s like buy 3, get one free I guess?! Hi Stacey! The crock pot method worked, but it was runnier than the jar method, so I switched back. 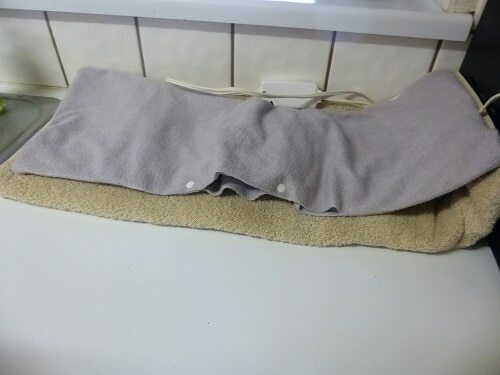 I REALLY like the heating pad on the counter, as it’s never failed me once. How much yogurt do you get for $3? I’m going to assume 16oz since that’s what you need for a gallon. Making it gives you 128oz for $9 (7¢/oz) and buying gives you 16 oz for $3 (19¢/oz). And just a note, you actually get 5 quarts when you account for adding in the culture. I tried this version of making yogurt and WOW, was it ever easy! Turned out so thick even using fresh, raw milk. I have had hit-or-miss results with other methods, so I think it’s safe to say that the heating pad method will be my go-to version from now on. Fantastic!!! Thanks for sharing! That’s great news Michele! I’ve never had a mis-hap with the heating pad either, which is why I just had to share!! How long will this yogurt be good? I just splurged on organic yogurt from grass-fed cows, so I’d like to stretch it by using it to make more. I’m just worried it’ll go bad before we can eat it all since it doesn’t contain all the preservatives that are normally in yogurt. I’m assuming it would be horrible if we froze it and then thawed it to eat later! Hi Kim! My yogurt is good for a full month. Likely longer, but I always make a new batch at the start of a new grocery budget cycle. Yogurt is cultured, and culturing/fermenting is a natural way to preserve foods w/o adding preservatives. You might think it wouldn’t last AS long, but in reality, there’s a good chance it’ll last LONGER! I wouldn’t recommend freezing yogurt for future consumption “as-is.” If you’re using it in smoothies or baking recipes, you’ll be fine. I have a troubleshooting question. I made my first batch of yogurt. Heated the milk to about 150, not to 180 (gasp, we didn’t die) and used (store bought) Greek yogurt with live cultures. It turned out amazing. Now my second batch, heated to 180 and used the starter from my first batch and this one has a lot more whey vs yogurt separation. Texture is the same but was wondering if it was the higher heat or my starter? I cultured for 8 hours both times since my husband doesn’t like it too tart. I had to hide this batch from my husband until I strained it so he wouldn’t think it went bad. Still trying to show him that real is better than store bought. I used 2% milk from Costco, all our Organic Milk in Salem, Oregon seems to be Ultra pasturized and raw milk is illegal. There are ways around it but it’s way too time consuming and not guaranteed. Any troubleshooting would be greatly appreciated. Thank you for all that you do. If it weren’t for you, Tiffany, we not be this far along in our real food journey. May the Lord continue His blessings!!! Thank you so much Janira for your encouragement! It’s such a blessing to me to hear feedback from you guys, and I appreciate you taking the time to comment and edify me. I pray God continue His blessings too!! I just came across your website! I have always wanted to try and make my own yogurt. You mentioned you live in central Ca. Me too!!!! How far are you from Modesto? You can also use powdered milk rather than gelatin. Add it when you mix the yogurt into the milk. I use 1/4 cup per quart of milk. I started making crockpot yogurt once a week since December 2014. My current method is to heat a gallon of whole milk to 180 degrees in crockpot then remove the crockpot insert and put in an icebath to cool to 115-120. The ice bath just speed things up. I then stir 2 heaping tablespoons of room temperature starter yogurt into a bowl of the warm milk. I have found that more started is not beneficial. I then incorporate the bowl of starter milk back into to the crockpot of warm milk. I then ladle the milk into individual 8 oz. ball jars. 14-16 of them. I put the jars in a a roasting pan filled with hot water, that is placed on top of the empty crockpot (Insert removed) turned on warm. Once jars are filled, I cover them with a sheet of plastic wrap and then cover with a towel. FYL, I have been adding 1/2-3/4 cup of sugar or honey or maple syrup as the milk heats and a tablespoon of vanilla once the milk is heated to 180 and the yogurt has turned out creamy and delicious every time, except the day I turned crockpot warmer off because I was going out and it cooled too much before setting up completely. That yogurt was runny. With this method, the yogurt is set up and ready in 6-8 hours. I use one of those probe style oven thermometers so I can gauge temps as I go along. I keep track of the water temp while they set up. If crockpot heats water bath over 118, I turn off and let temp go down to 110 then turn back on. This yogurt is delicious. I like the separate serving jars. I’ve been wanting to make my own yogurt for quite awhile. Problem is Finding Raw Milk (cow or goat) around here. I don’t buy grocery-store milk. Was buying Horizon but stopped when I found out they were owned by a Pro-GMO corporation. So I am envious of those who can make their own yogurt – but until I find the good Raw Milk, I’ll have to keep buying my Plain Greek Yogurt. Just a quick food for thought Bets – is the yogurt you buy made with raw milk? How high do you turn the heating pad? I turn mine on low Lucretia! I make mine with raw milk and don’t cook it, so I did my first batch at high, but thought maybe it was a little hot. So was curious at what temp you set yours. It’s supposed to culture at 100F, but I don’t know the exact temperature of the heating pad. I’ve done it once on medium and it didn’t turn out, lol, so I went back to low. Yours might be different though! Been making my own yogurt for years now. As much as I love just straight eating it (usually dollops over frozen fruit and a drizzle of raw honey is my favorite ), I love to use it to make other stuff. Easy sour cream is simply 1 tbsp of yogurt, 1 qt of heavy cream, pour into mason jar, cover with a coffee filter and leave 1 to 2 days on counter for the best sour cream in the world (which in turn is used to make a ton of other stuff like 3 ingredient ice cream, etc). So versatile, so wonderful for my poor lactose intolerance self. Yogurt bath bombs, yogurt shampoo, yogurt soap, yogurt candles, etc, etc. Can you make a smaller batch instead of a whole gallon can you make just 1/4 gallon? I’d hate to waste it all if I don’t like it or if my lactose issues don’t subside. So I found your website about a week ago (I love it) and I am on overload with all these new DIY possibilities. This is all new to me since I learned to cook from boxes and cans! Anyway, if I make my own yogurt using the mason jars… Do I need to do any special preparation for the jars? Do I need to sterilize them first? Can I freeze ithe yogurt in the jar? I feel like iI read freezing certain types of glass was bad (somewhere). As for the yogurt, washing the jars in the dishwasher will satisfy both cleaning and sterilizing. You CAN freeze yogurt, but I’ve not done it myself and there’s a trick to freezing in jars so that the jar itself doesn’t break. If you want to freeze the yogurt, I suggest making it in the jars, then transferring it to up-cycled old yogurt containers, or other easy-to-freeze devices. Some people freeze in ice cube trays for easy access to small amounts too! Some mason jars are fine to go in the freezer – just check the label. I make yogurt in small batches and do it frequently (I have a pretty healthy yogurt habit to keep up with), so I’ve never frozen an entire jar of yogurt. Other things in jars, yes. Leave extra space for expansion. How do you keep the temperature warm for so long Fasmina? Hi, i am just wondering what a heating pad is? I have never heard of a heating pad and don’t know where to get one. I am in New Zealand – maybe it’s called something different here? ? Is it an electric blanket that you put on your bed, or could this be used instead? Hello! It’s similar to an electric blanket, but much smaller. Maybe 2 ft x 1 ft? But it’s the same concept! Tiffany, can you make yogurt from fresh goat milk? I can get fresh goat milk from a neighbor for $8 a gallon. I also want to try making ice cream. So I want to try this but I’m not understanding how this is considered homemade if one of the ingredients is actually yogurt… Is it a special kind? No special kind at all Hailey! You’re essentially starting with 1 cup (ish) of store-bought yogurt and using it to turn 1 gallon of milk into 1 gallon of yogurt. It’s homemade because you’re not buying another gallon of yogurt! I would like to make coconut Joghurt instead of milk or cream. I am considering trying this on our journey to frugal real meal planning. My convection ovens have a 100 degree bread proof setting (which works like a charm for bread proofing). Has anyone tried putting the jars in the oven on 100 or on a bread proof setting? I believe both of our heating pads have the auto-off. Thanks so much for all you do and for the great community you’re creating. I’ve been replying to the emails and look forward to chatting with you! Hi Ashley! I’ve put yogurt in the oven before, but I don’t know what temperature it was because it wasn’t digital. Hopefully someone else has tried this and can chime in with their experience! 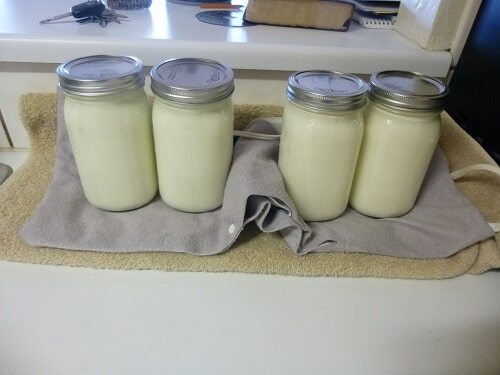 I have been making homemade yogurt since last summer when a friend shared your resources. I found I can put the jars in the oven with just the oven light on. The heat is perfect, and I don’t lose counter space. Yes! My oven light didn’t work for a long time, but it’s good to hear this method works too! Hi Stacy! For the most part, homemade does eliminate mainstream flavors, so we sweeten with fresh or frozen fruit. It’s a rare occasion that my family has eaten flavored store-bought yogurt anyway, so not adding sugar wasn’t a big deal for us. If it is in your family, sweeten however you’d like so that it goes down, and then gradually reduce the quantity, eventually switching to a healthy sweetening option! Thank you! I will try honey and fruit. I do love the lime and orange Greek yogurt but maybe I can come up with a new way to sweeten that will also be delicious. Thanks for the tips! We had an abundance of apple jelly this year so that is what my husband adds. I like blueberries and walnuts or a bit of homemade granola. Experiment and see what you like. Thanks Sue! That sounds delicious as well! I love adding chia seeeds or hemp seeds as a nutritional boost as well. I live in rural Michigan. Farm country but not healthy farm country, more like home of the dollar pump us full of more junk and chemicals. We have weird laws here about raw milk. I can’t even purchase it legally. I do think it can buy a cow share though and through that I could possibly be entitled to a share of the milk. The closest organic farm where I could even buy a cow share is hours away, so this is a) not really a time avaliable option as I would need a minimum of 2-3 gallons a week, b) the cost of traveling to get it as well as the purchase itself is probably not doable. I have been purchasing the best milk is can find where I live. Sadly it is organic but both homogenized and ultra pasteurized. I haven’t been able to find a single one that’s not in 3 cities around me. I pay a a small fortune for milk monthly and it’s just sickening that I can’t get anything better! I pay 12-14 for 3 half gallons! I know it’s not even close to being as good as the bottom of your list but it’s what I can get and I was wondering if you could tell me if you think I can even use it for yogurt making? I had read some other receipes that said you can’t even use pasteurized milk to make it…. Please help! Thank you for taking the time to answer that question for me. I really didn’t want to try on your to find out if wasted my valuable milk! Have you tried making yogurt in the instant pot? Have you tried adding gelatin to the yogurt during the hearing process? I read that it works great to thicken it almost as a Greek yogurt. I am curious about quantity. How long does your yogurt typically last in the fridge? and the whey? I can’t imagine us going through all this yogurt I just made in a week, haha. I usually give homemade yogurt a one-month time span, in the back of the fridge.